TLDR: Beyond Bitcoin, blockchain is being implemented in a diverse range of industries, from supply chain management to sustainability tracking. But there’s still some way to go before blockchain can become a universal business infrastructure like the internet. Learn about four major shifts that need to happen for blockchain to flourish. After an impressive price run which saw Bitcoin soar to more than US$19,000 a piece in 2017, the hype over cryptocurrencies seems to have dwindled in 2018. But just because cryptocurrencies haven’t been making news headlines as frequently as they did before doesn’t mean that governments, businesses and innovators have given up on blockchain—the underlying technology that powers Bitcoin. Also known as distributed ledger technology, blockchain serves as a digital record of transactions among peers on a network. Every account holder on the network owns a copy of the ledger that is updated in real time—hence the term ‘distributed’ or ‘decentralized’. Once a transaction has been validated and placed on a blockchain, it is given a unique cryptographic signature (called a hash), which prevents any further tampering of the record, making blockchain an immutable archive of transactions. 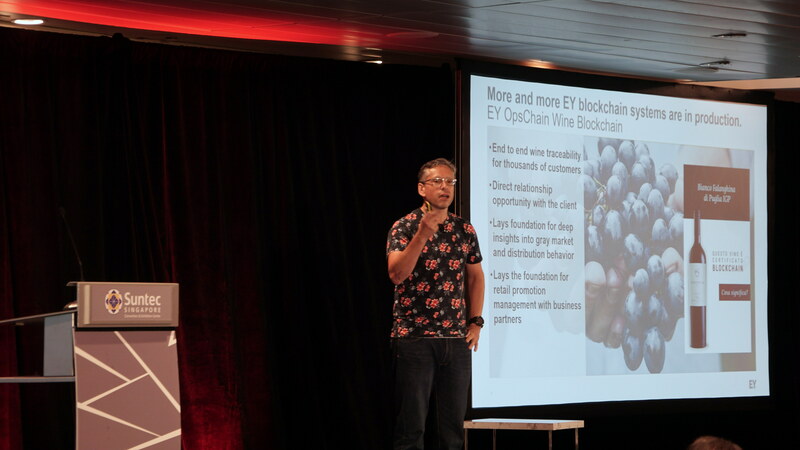 “In the future, I think blockchain is going to be like the internet—something every company uses as part of a universal business infrastructure—and we believe that there are going to be four important transitions in the world of blockchain to make that possible,” said Mr Paul Brody, global blockchain innovation leader at Ernst & Young, during his talk titled ‘How Companies are Industrializing the Blockchain and Where They Need to Go Next’ at the Blockchain Summit Singapore 2018. Here are the four transitions that he thinks need to happen for blockchain to achieve ubiquity. There are two main flavours of blockchain: public and private. The Bitcoin blockchain is known as a public one—anyone can set up a pseudonymous account to carry out and validate transactions on it. In contrast, a private blockchain is one where access is granted only to authorised parties with known identities. Most companies prefer using private blockchains as it affords them the ability to know who they are transacting with. However, Mr Brody believes that in the long run “private blockchains do not scale” because they hinder inter-operability among enterprises. Nonetheless, private blockchains allow businesses to protect their corporate data and interests, unlike public blockchains which require all data and transactions to be visible to everyone on the network. To enable a shift from private to public blockchains, Mr Brody highlighted the need for zero-knowledge proofs—a protocol that allows one entity to prove to another that something is true without having to reveal what that ‘something’ exactly is. Think of this as knowing that a phone call occurred between Alice and Ben without knowing the content of the conversation that transpired between them. Mr Brody noted that this core technology is now available and is already being deployed. “Blockchains were built and designed from the ground up for the purchase and sale of tokens,” said Mr Brody, adding that “anything you can create, you can turn into a token.” However, tokens must be accurate digital representations of products, services or processes to be useful. The fundamental concept of a token, therefore, needs to change. To this end, Mr Brody suggested having a hierarchical token—one that reflects the reality that manufactured products are built in a hierarchical fashion from component materials. It is by building proper representations of things happening in the real world—both physical and financial—that fully tokenised transactions on blockchains will take off, he said. Unlike fiat currency—money that is backed by a government, there is no assurance of value for cryptocurrencies, whose prices tend to fluctuate greatly. This means that cryptocurrencies are neither a convenient nor stable medium of transaction for businesses. “The fact is that if your company is built on dollars, euros or yen, and your expenses are in dollars, euros or yen, the idea that you would somehow go onto the blockchain and start paying for stuff using Bitcoin is crazy. You’re essentially embracing an additional level of foreign exchange risk,” said Mr Brody. In the future, however, he thinks that central banks will create and issue their own fiat currency token that “looks like a dollar, works like a dollar, is worth a dollar and acts like a dollar”. This not only eliminates the foreign exchange risk, but also reduces the volatility that has traditionally plagued cryptocurrencies. The blockchain and cryptocurrency space is pretty much the Wild West right now. Initial coin offering (ICO) scams are rampant, and reports have emerged that the money flowing into cryptocurrencies are being used for criminal activity such as money laundering, extortion, tax evasion and the purchase and sale of illegal items. As with all emerging technologies, the law has yet to keep up with the rapid evolution of blockchain, but Mr Brody expects regulators to eventually put in place more rules to ensure greater accountability. Drawing parallels with the internet, Mr Brody concluded that each country will likely have its own rules and regulations surrounding the use of public blockchains. When all these transitions have taken place, “we are going to experience a shift from an interesting set of solutions on private blockchains to universal business infrastructure,” he said.